The unique new SSL console automation system unites the very best of automation in the analogue console domain with DAW based workflow. δ-Ctrl is a native AAX/AU/RTAS/VST/VST3 plug-in that allows automation of Duality as if it were a DAW Plug-in. The automation system in the DAW is used to record and playback control data from the faders and switches on the console as an alternative to using the SSL legacy automation system in Duality. The δ-Ctrl plug-in is inserted into a DAW mixer audio channel. The plug-in then receives and sends control data from an assigned Duality channel, VCA or Master fader via a high speed Ethernet Network connection. Audio on the DAW track passes through the plug-in slot unprocessed so the plug-in can be combined with other DAW plug-ins. The console Fader, mutes and relevant switches are represented as plug-in parameters in a δ-Ctrl plug-in GUI and their automation data is recorded to the automation lane of the selected DAW channel. In playback the plug-in converts the stored automation data from the DAW into δ-Ctrl messages and routes these back to the console via the SSL Logictivity Network connection. Automation data can be viewed and edited as normal plug-in data in the DAW tracks. The console Fader, Absolute and Trim values are saved using the same dB law as your selected DAW automation so that the ‘Paste Special’ command can be used to copy existing DAW fader data into the plug-in. The Paste Special feature is available in Pro-Tools and in most but not all DAWs. 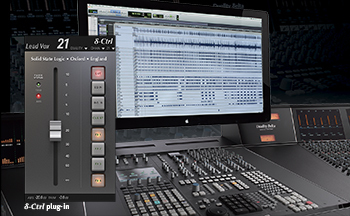 δ-Ctrl retains all the key operational elements of SSL’s Signature Mix System with much loved features such as JOIN, REVISE, MOTORS OFF and SNAP Override all actioned from dedicated front panel switches. The MOTORS OFF mode offers the full non moving fader SSL VCA mix experience as preferred by key industry re-mixers. A new MOTORS OFF, Touch Write mode emulates the SSL G Series Mix system Immediate Pickup (IP) option. δ-Ctrl also works with SSL AWS δelta consoles. There is an inherent limitation in the architecture of Apple's Logic Studio software. Logic prevents any controller from controlling more than one plug-in at a time. Viewed purely within an 'inside-the-box' paradigm this makes some sense in that the control interface is the mouse or trackpad but it presents significant limitations to the way hardware controllers can be used with the software. It is with much regret that the single Fader δ-Ctrl Plug-in does not work with Logic. The multi-channel δ-Ctrl Plug-ins available for AWS, Matrix and Sigma are not compatible with Duality Delta consoles. 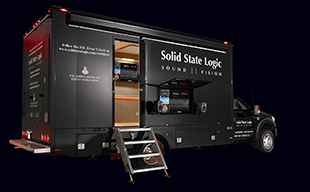 Logic users can still use SSL's A-FADA system to enable the Duality motorised faders to follow Automation Data from the DAW.